DON'T READ THE INFORMATION BELOW. TO AVOID A FOOT IN MOUTH MOMENT, PLEASE READ EVERYTHING BELOW. 5 MINUTES HERE WILL SAVE YOU HOURS LATER. GOOD CUSTOMER SERVICE BEGINS WITH TRANSPARENCY. WE BELIEVE THAT YOU SHOULD KNOW HOW THE PROCESS WORKS AND AS SUCH WE HAVE INCLUDED A TON OF VALUABLE INFORMATION IN THIS LISTING TO HELP YOU DECIDE IF REPAIRING YOUR CONTROL BOARD IS RIGHT FOR YOU. THINGS YOU SHOULD CONSIDER BEFORE SENDING YOUR PART TO US FOR REPAIR. We invest big into our technicians and the tools they use. It's why we have the best success rate in the business. We take our jobs seriously and we hope you will respect our time and the effort we put forward. It's NOT an extra charge. We earned it, and we hope you will respect that. THIS IS NOT A PART! YOU ARE VIEWING A REPAIR SERVICE WHICH REQUIRES YOU TO SEND IN YOUR CONTROL BOARD TO US TO BE REPAIRED. If you are choosing to have a repair done, it's likely because the part you need is no longer made. We understand the stress you are going through, but you have to understand that these repairs are not always a perfect process. We have good feedback for a reason, but we are also human. We will make a mistake at some point with someone, and we hope it's not you, but in the event it is, please try to remember that we aren't just some faceless business. We are all hard working people just like you with families, friends, and lives outside of repairing circuit boards. Like all people, we respond better to patience, kindness, and respect. We will go to the ends of the world for you if you maintain that philosphy with us, even if we make a mistake. In the event you choose to go nuclear on us, we have a special person that handles those calls exclusively. If John Wick were a real person, this is who that person would be so fair warning. We love you all, but you are the worst offenders... PLEASE, PLEASE, excercise good communication with your customer, as we are doing with you as our customer right now. If you are going to play the middleman between us and your customer, make sure you communicate that this process doesn't happen overnight. We absolutely want your customer to be happy with you, but if you fail to communicate to them and you take their frustrations with you, out on us, you will get zero sympathy from us. Along side our control board repairs, we also do in home repair. We know what it takes to keep a customer in the loop and happy. However, when someone sends us a control board that looks like it went through a nucler blast, we make a promise that we will do EVERYTHING in our power to fix that part, just as we promise to fix the part that just needs a few parts changed out. Because we can't predict what we get in each day, we also can't provide a time guarantee. If we are running behind, it simply means that more people in the world are having issues and we are giving each and everyone of you the same level of dedication. So please be understanding that turnaround times can fluctuate up and down. For those who need their parts repaired faster. We have a limited number of expedited orders we can do per day, so you must call in BEFORE your part arrives to expedite the repair. We've noticed over the years that a few of our once customers, have tried to clone our process and are now offering a similar service. First and foremost we love and support small business, however, being a copycat is just lazy. So we are launching a campaign to see how low our competition is willing to go. In fact we will make a site wide change in pricing for that repair for you and all future customers so that we are always priced lower than our competition. Our goal is to make doing business with us a win win. It's like having your cake and eating it too. We also have really awesome hold music. Who knew waiting could be enjoyable.. We specialize in board level repair, with a 98% success rate. Through our proprietary repair process our service will correct all major failures with your appliance and/or electronic control board(s). We have some seriously smart technicians that will use highly developed skills and a touch of wizardry to repair what someone else probably told you needed to be replaced. Here are some things you should know. We are a US Based, English speaking company right in the heart of America in Lenexa, Kansas. Our success rate is about 98%. If a part is available, we can sell you a part instead. They are more expensive, but do provide a quicker turnaround. We are humans, this means we can't guarantee you a successful repair. But our reputation means the world to us so in the event your part can't be fixed, we will try to find alternative solutions because at the end of the day we just want to help you solve your problem. Most codes are directly related to the control board. You can check our trouble shooting section to see what your error code means. If the board is the problem we can fix it! Display not working, intermitently going out, or just really dim? We can sometimes fix this without even replacing the display. However if we have to replace the display there may be an extra charge. Damage form lighting or power surges can quickly damage components. While not all problems can be fixed, we have a very high success rate at repairing components damaged by electical shock. If your broil function stops working, first check the element. If it's functioning properly then the control board needs to be repaired. If they are functioning properly then the control board needs to be repaired. If your temperature is getting too hot or not hot enough, Check your temperature probe first. If that is good, then the control board is the problem. We can solve this problem for you! The transformer converts high voltage down to a lower voltage for the control board. They are either part of the board or seperate. We can fix these if they go bad, however replacements do cost extra. Keyboard is non-responsive or causing error codes? Check and clean the connection, if that doesn't fix it, the keypad and/or control board could be the issue. Please note that keypads are not included in the price of our control board repair. MCU (Micro-Controller), Display Driver IC, or EEPROM bad? Creating an order is simple. Type your part number into the search box and add the service to your shopping cart. From there follow the onscreen prompts. It takes about 5 minutes or less to create a service order. If you don't know your part number give us a call! Simply follow them the best you can. One of your most important steps! Make sure you read the instructions and follow them as closely as possible. This will ensure your order doesn't get delayed once it arrives. Once your part arrives, it will be processed in. We document all contents sent and make sure all needed parts were sent. In the event you did not incude something, we will contact you. You are then placed into the repair queue. Once your part arrives, you are good to go! Reinstall your part and get back to business! We also have and an optional lifetime coverage plan. Accidentally plug things in wrong after you get it back? How frustrating would it be if after you had your part fixed you had storm and lightening took it out. Use your appliance more than the average person? No problem, we cover wear and tear on the part. Did you or your technician accidentally drop it? Let the dog chew on it? Our competitors like to tell you that you can't use your clean cycle because it gets too hot... You can turn your oven into kiln if you really want to, because you're covered! Everyone makes mistakes, including the professionals who install these parts for a living. We could spend days listing all the things that could cause damage, but we won't, because it's all covered! As long as the part hasn't been damaged to the point of no return it's covered! Now for the part where we talk about all the things no one wants to talk about... There are some important things you need to know before you decide to do business with us. Customer Service and Integrity are very important to us. Which is why we take the time to outline all the "fine print" of our terms and conditions. We encourage everyone to read them but we have picked out the most important things you need to know BEFORE you choose to do business with us. While our job is very rewarding, it is also very stressful and time consuming. This portion of what you pay is non-refundable regardless of outcome and becomes non-refundable the day your part arrives at our facility. However, if you send the keypad/touchpad with the control board we will diagnose it for free! If it is malfunctioning we will quote you the cost of repair or replacment. If you order this service by mistake, or, you change your mind, no problem! Unfortunately in our industry not everything can be repaired. Please know that we do everything in our power to repair your part, if it is deemed non-repairable it's a decision that was not made lightly. Circuit boards can contain proprietary components. Proprietary components contain protected data or components that were made specifically for that part. Micro-Controllers, Screens, Transformers, and Keypads are proprietary. If a proprietary component is bad and can't be immediately sourced, we will give you the option of keeping the order active while we hunt down the proprietary component needed to complete the repair. Choosing to go on the donor list makes the entire service non-refundable due to the time investment to locate the component. 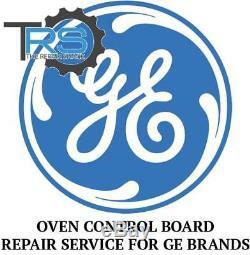 The item "Repair Service For GE Oven / Range Control Board WB27T10297" is in sale since Tuesday, August 5, 2014. This item is in the category "Specialty Services\Restoration & Repair\Electronics". The seller is "therepairshack" and is located in Lenexa, Kansas. This item can be shipped worldwide.